Every reverse osmosis unit has a one-way valve called a check valve in the “permeate” line as it leaves the RO membrane housing. This is usually a small, inexpensive part, but it is essential to the function of the unit. Without a properly working check valve, the unit will not shut off properly when the tank is full, a great deal of water will be wasted, and eventually the membrane will be ruined. The white shutoff valve in the picture is from one of our Black & White units. This is a John Guest check valve. Flow is toward the shutoff valve then to the John Guest tee, which connects to the storage tank. The small white check valve pushes into the fitting, which is then installed in the the permeate port of the membrane housing. The small valve allows water to flow away from the RO membrane but not back toward it. The gray fitting is a John Guest elbow and the white fitting is a Jaco elbow. At right is an insert check valve from a standard RO unit. 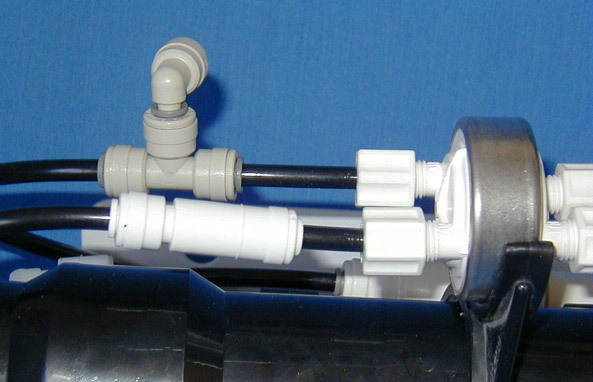 This small check valve is inserted into the tubing elbow that connects the permeate port of the membrane housing to the tube. Different sizes are used for John Guest and Jaco elbows, so be sure you know what style fitting you are buying the check valve for. In addition to the membrane check valve described above, we also provide a check valve in the drain line of the units that we make. Its purpose is to prevent backflow into the unit in the event of a clogged drain. 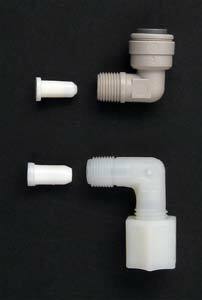 You can add a check valve to the drain line of any RO unit.